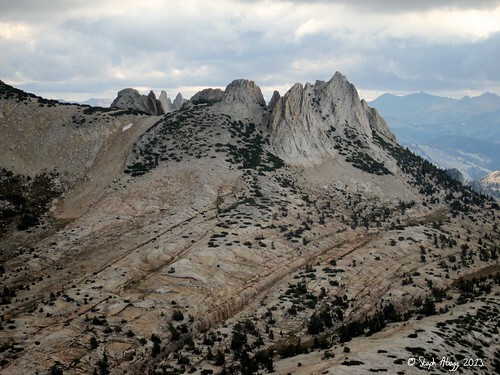 This is a great way to approach and deapproach the spectacular glacier-sculpted mile-long fin of Matthes Crest. The previous week as we (Dan, Chad, Sarah, and I) drove south to do some climbing in California's High Sierra, unstable weather caused us to take a detour to Tuolume, where we enjoyed a climb up the North Face (5.9) of Fairview Dome. Passing through this area, we couldn't help but be impressed by the mile-long knife-edge fin of Matthes Crest we saw in the distance. 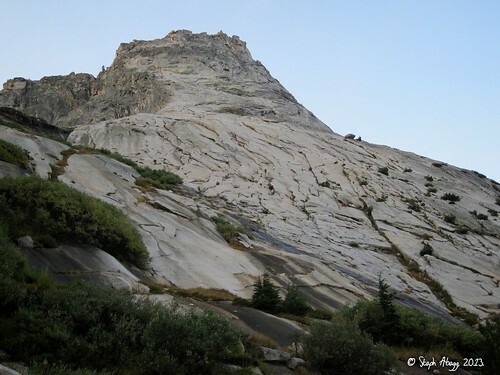 I had been fantasizing about traversing Matthes Crest ever since I had seen this fin of glacier-sculpted granite while doing the Cathedral Traverse earlier that summer. We thought a cool way to approach a climb along Matthes Crest would be via the slabby Northwest Buttress (5.5) of Tenaya Peak. Then, after traversing Matthes Crest, on the hike out one could climb up the Southeast Buttress (5.6) of Cathedral Peak, a Tuolumne icon. We decided to try to fit this so-called "TMC Linkup" into our trip when we drove back north after climbing in the Sierra. So on our drive back north a week later, we re-entered the park. 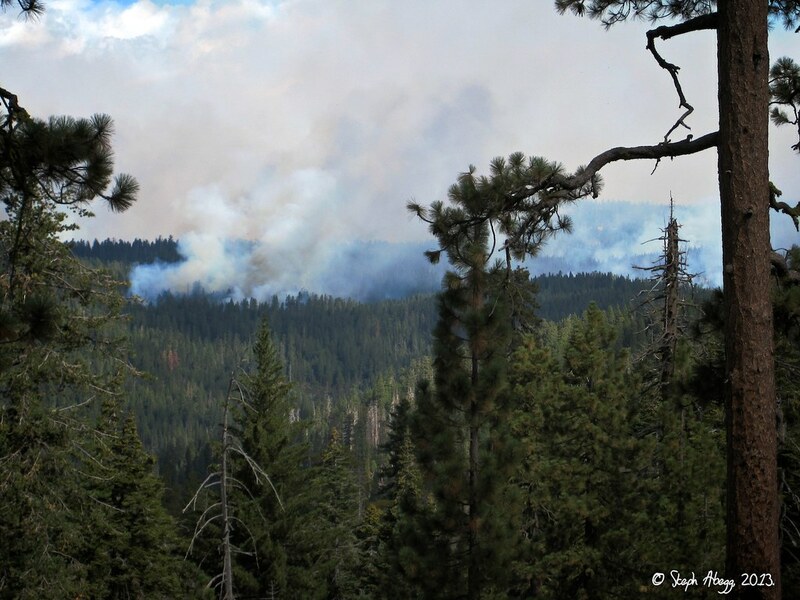 We were a bit concerned by a major forest fire—the "Rim Fire"—that had been growing near Tuolumne over the course of the week and was only about 20% contained by this time. But most of the smoke was blowing to the north and settling in valleys (in fact, we had to forego our plans to climb the Incredible Hulk because of smoke that settled into that valley), so we headed for the TMC Linkup. 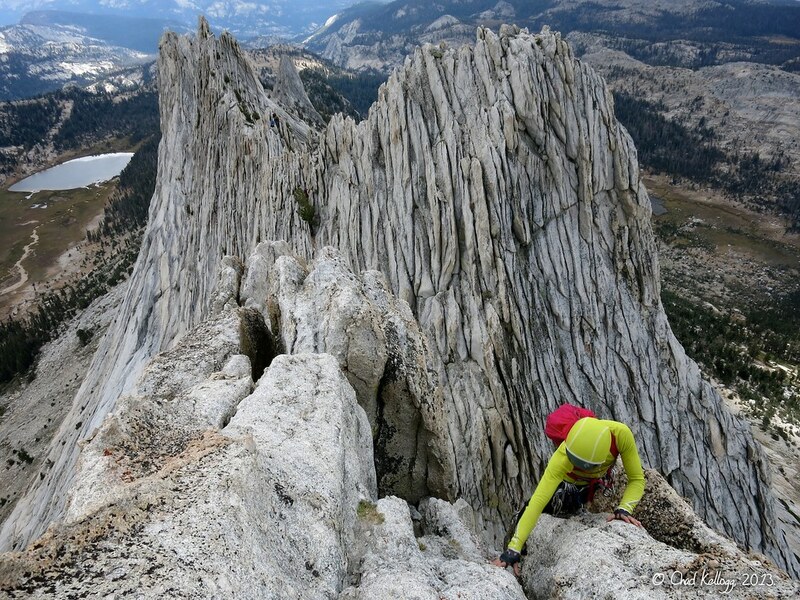 As the climbing sections would be mostly low 5th class up to 5.7 in a couple of spots, the plan was to solo and simulclimb as we felt comfortable. Map showing the route of our "TMC Linkup." It starts at the Tenaya Lake parking area and ends at the Cathedral Lakes trailhead, so either a carplant, hitchhike, or road walk is required. The following page gives a trip report for our TMC Linkup. Needless to say, it was quite a spectacular day of alpine climbing. Tenaya Peak as seen from Tenaya Lake. The red arrows show the general path of the route up the NW Buttress. We pretty much stayed on the route in the SuperTopo, but there are several variations (hence the ambiguous arrows rather than a specific route line). Tenaya Peak is the huge slab of granite rising above Tenaya Lake. Unlike the knobby, flaky granite of Cathedral Peak and Matthes Crest, the rock on Tenaya Peak is slick and cleanly fractured. 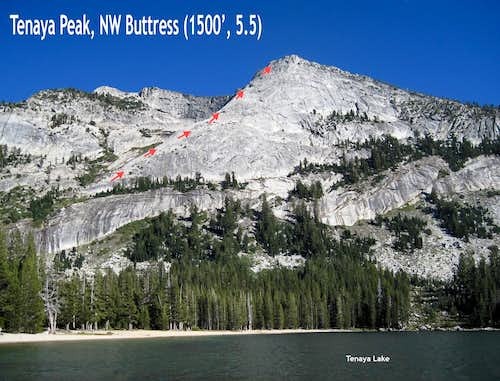 The route up the Northwest Buttress gains 1500', and is consitenly 5.0-5.4 climbing, with a few crux 5.5 moves. 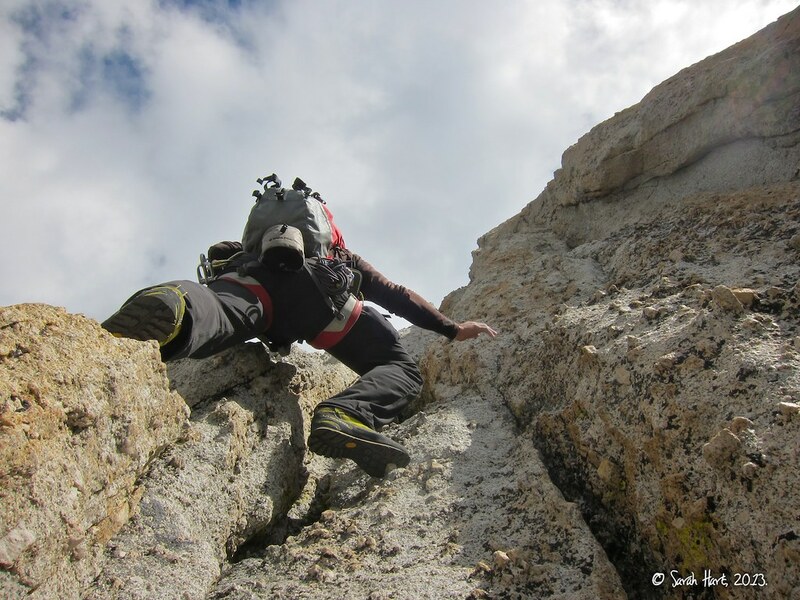 The plan was to solo up Tenaya Peak to gain the high plateau on the other side. This high plateau would provide a mellow cross-country route to Matthes Crest. 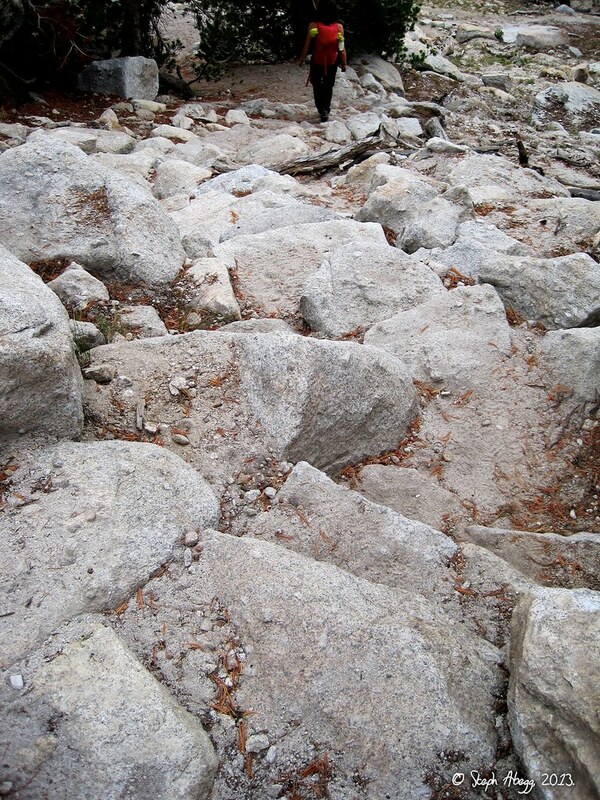 It took us under 2 hours to get from the trailhead to the summit (1:19 from the base of Tenaya to the summit). It was a really fun way to gain 1500'. 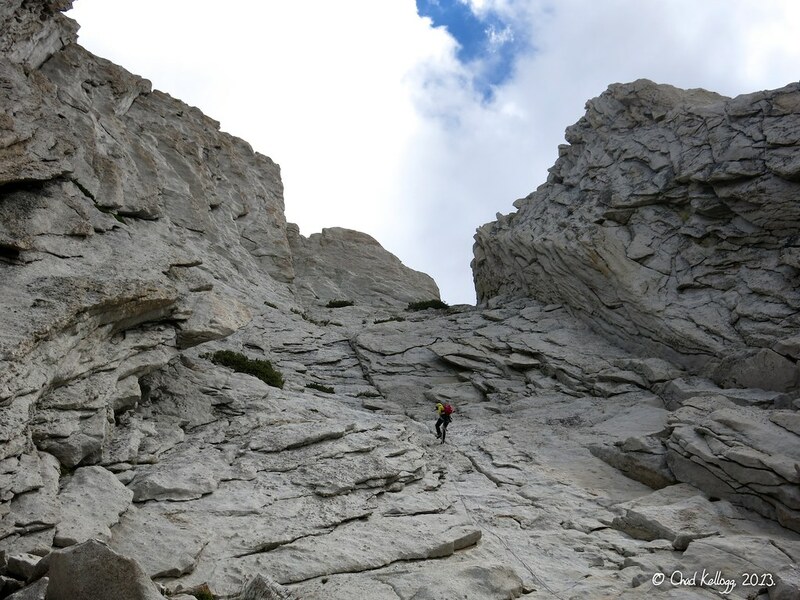 Approaching the Northwest Buttress of Tenaya Peak. 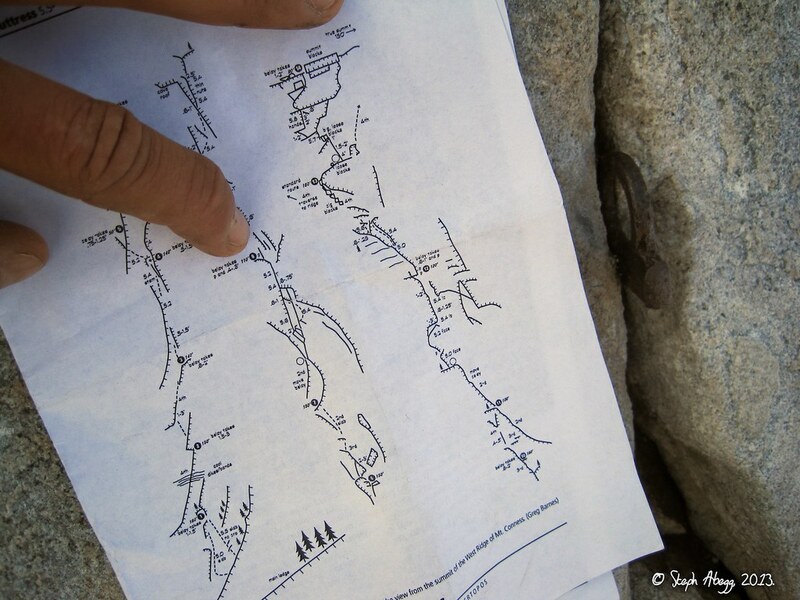 It took us about 30 minutes to get from the trailhead at Tenaya Lake to the base of the slabs of Tenaya Peak. Looking up the Northwest Buttress. 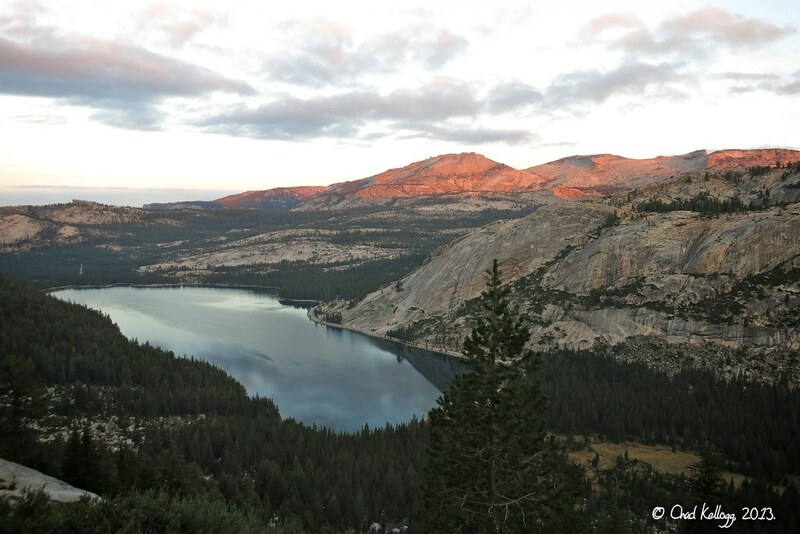 Tenaya Lake below, just around sunrise. Beginning the climb up the Northwest Buttress. We put on our harnesses just in case we wanted to rope up, but we ended up soloing the whole route. The rock on Tenaya is just so solid that it makes for a reasonably safe solo for those that feel comfortable at this grade. Piton en route. 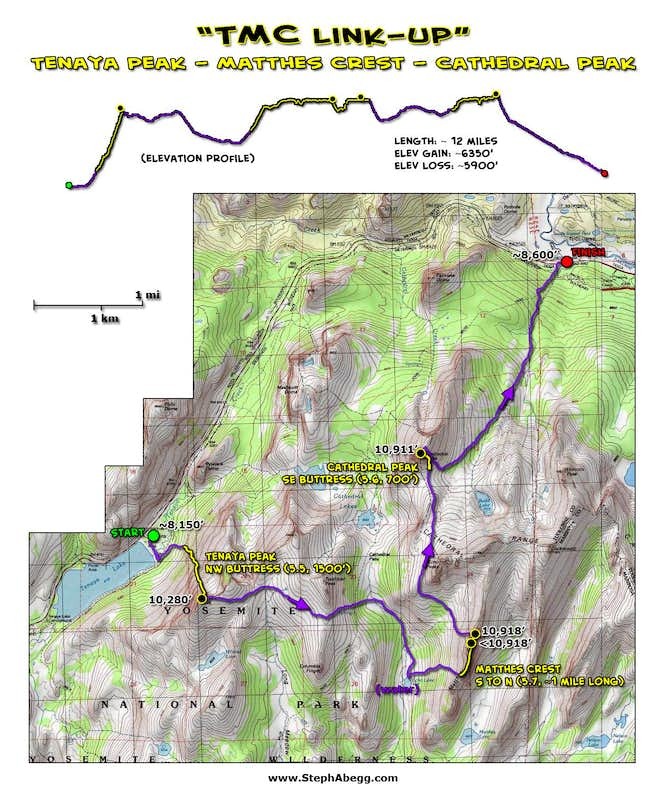 In general, we followed the route in SuperTopo, although there are several possible variations. 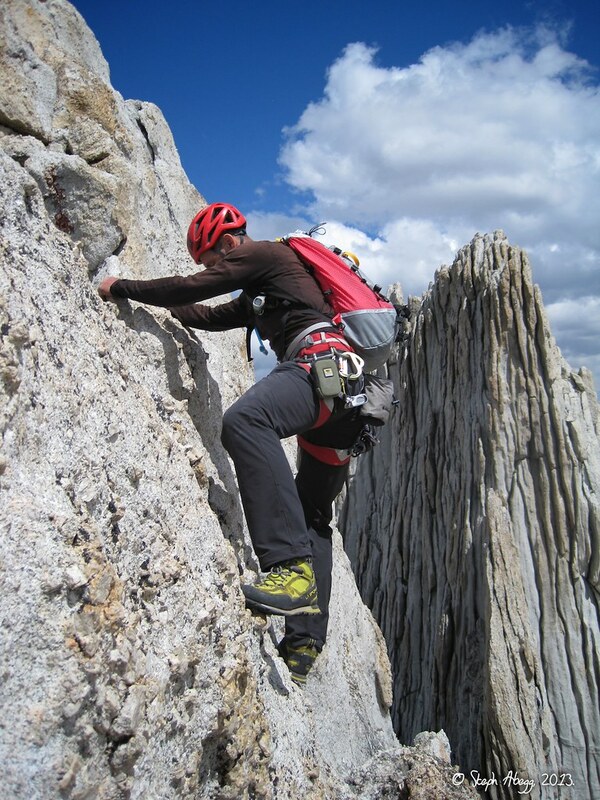 Soloing up the Northwest Buttress of Tenaya Peak. Dan and Steph climbing along a corner near the top of the Northwest Buttress. 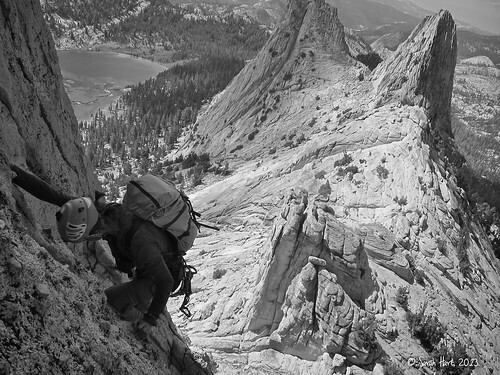 The standard finish to the Northwest Buttress is an easy traverse off left. We did not go this way but instead we went right and then straight up, which is bit more challenging but a more direct route to the summit. We gained the summit of Tenaya by going right and then straight up; a few of the moves were 5.7ish. Chad on the summit of Tenaya Peak. Tenaya Lake below. Looking down the slabby Northwest Buttress on Tenaya Peak from the summit. Billy and Zieggy enjoying the tour. 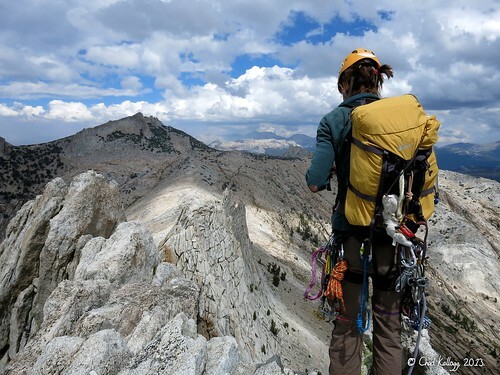 Next stop: Matthes Crest. 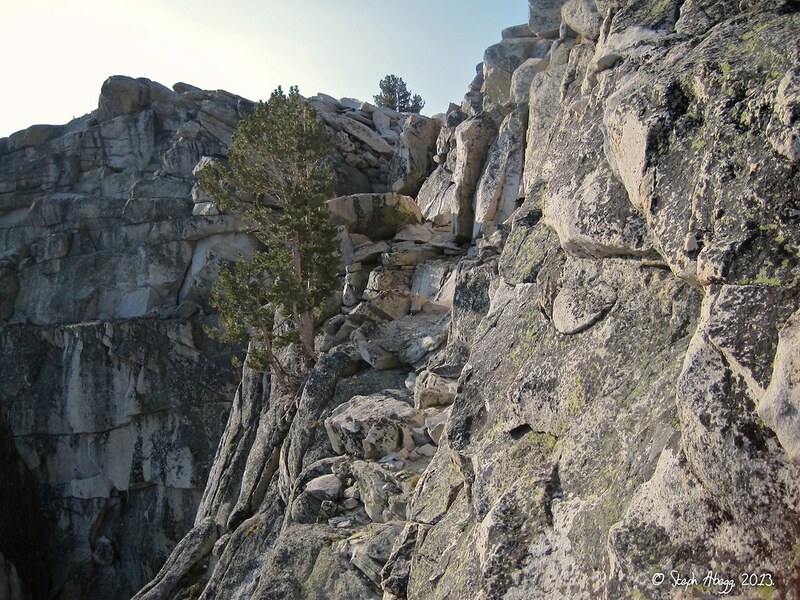 The traverse from the North summit to the north end of Matthes Crest. 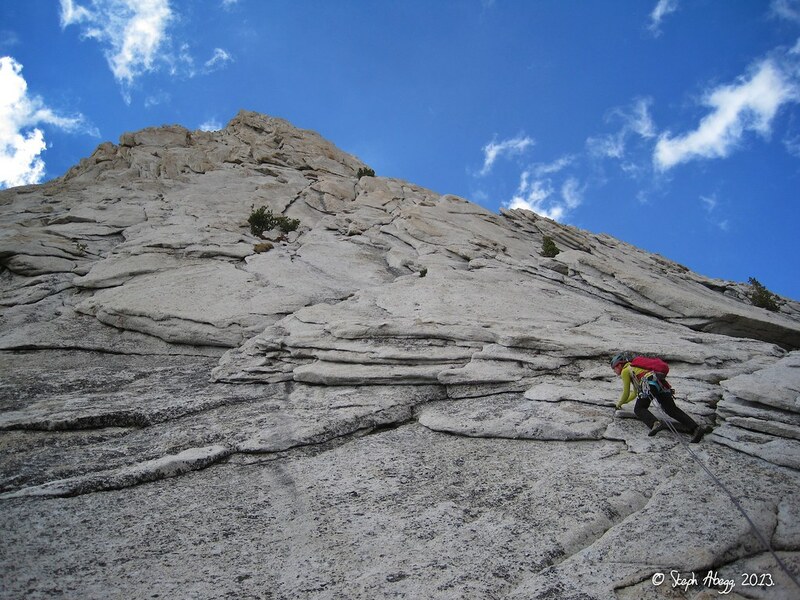 This is an extension of the "standard" Matthes Crest traverse and is not done nearly as often. 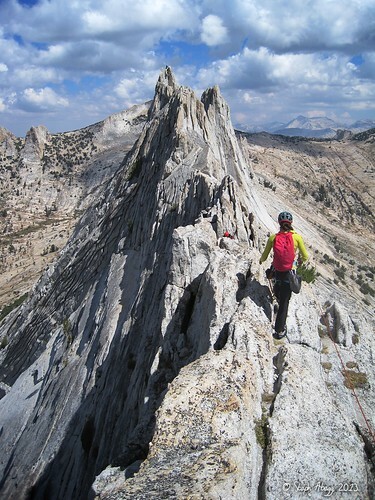 The standard Matthes Crest traverse from the south end of Matthes Crest to the North summit. The headwall pitches at the south end of Matthes Crest. Apart from the climb up to the North summit, this is some of the steepest climbing on the route. The knife-edge fin of Matthes Crest is a Tuolume classic. Unlike most such ridges, it is not a low point between peaks, but a completely independent formation. 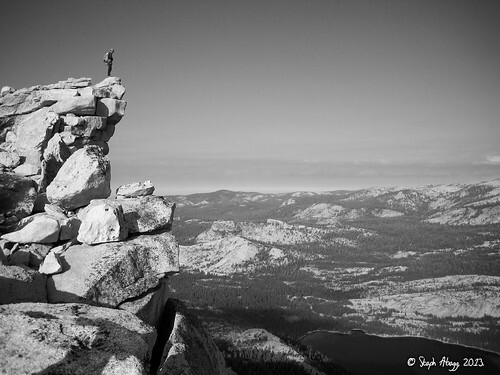 High and spectacular in a region of sweeping expanses of granite, Matthes Crest is unique. And utterly spectacular. 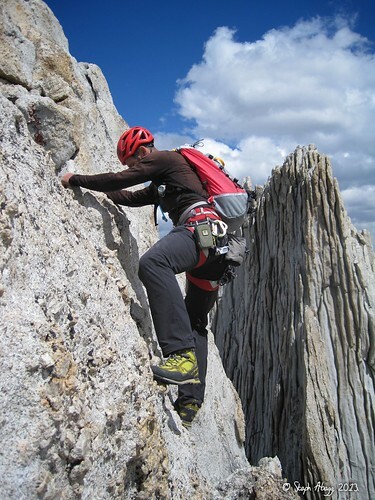 The standard Matthes Crest traverse is from the south end to the North summit. With the ups and downs, the climb is about a mile long. 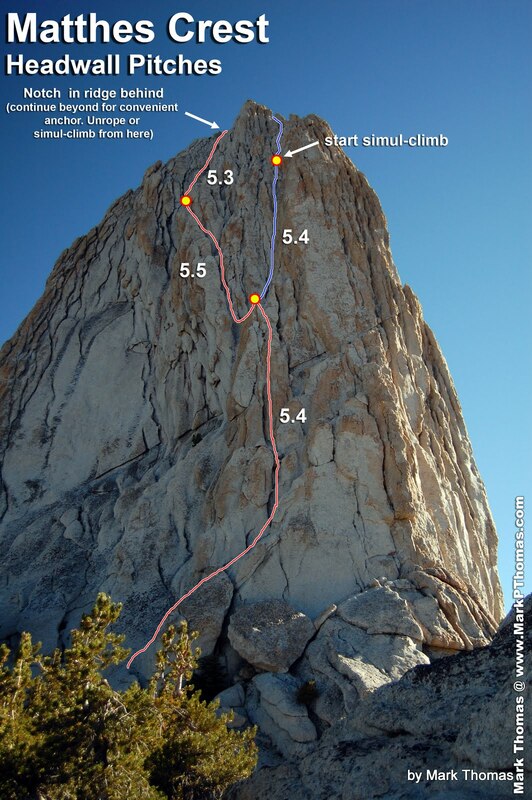 There is a wide variation of how long it takes to get to the North summit (SuperTopo: "as little as three hours if simul-climbed and over 12 hours if every pitch is belayed"). 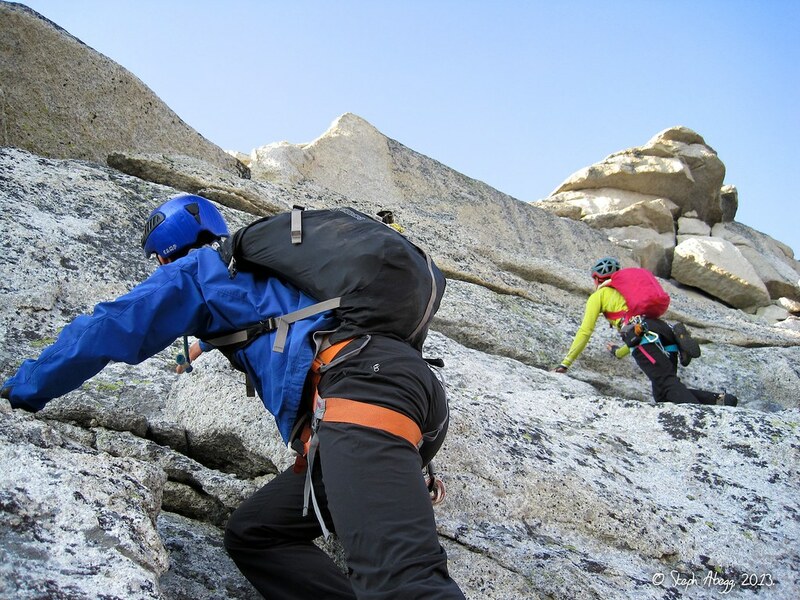 We soloed the route all the way to the South summit, and then belayed the section between the South and North summits, which was perhaps the most challenging climbing on the route. It took just over an hour (1:16) to get to the top of the South summit and an hour more (2:15 from south end) to get to top of the North summit. 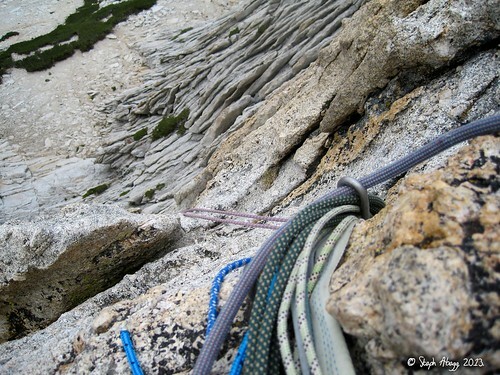 The standard traverse ends at the North summit. 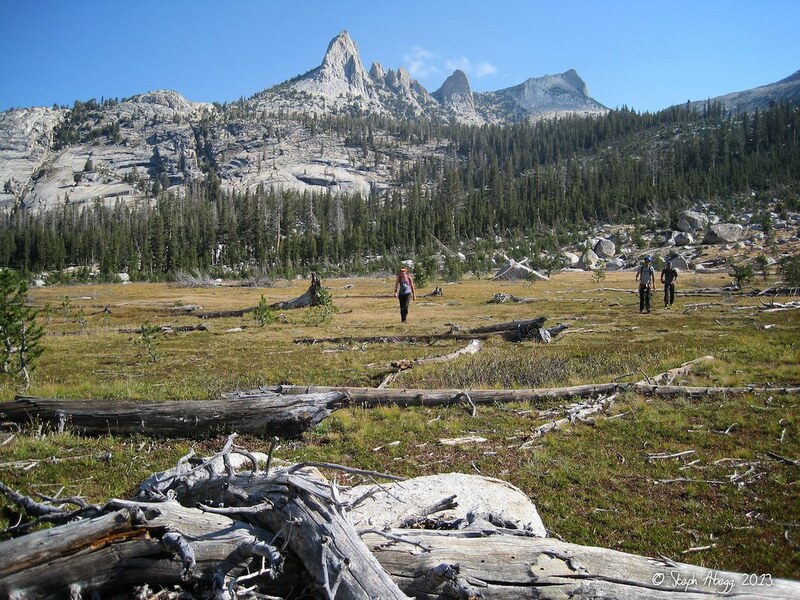 We had planned to continue onward from the North summit to the north end of the Crest, but questionable weather and slightly worrysome forest fire smoke in Tuoloume Meadows encouraged us to descend from the North summit. 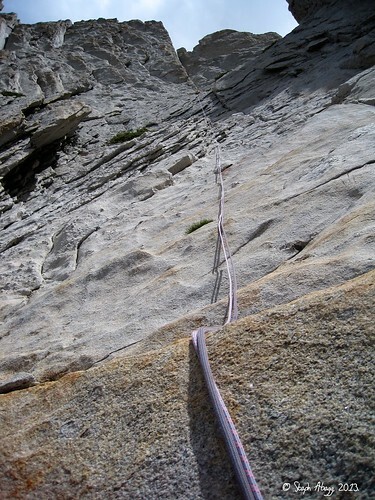 The descent involves two double rope rappels. 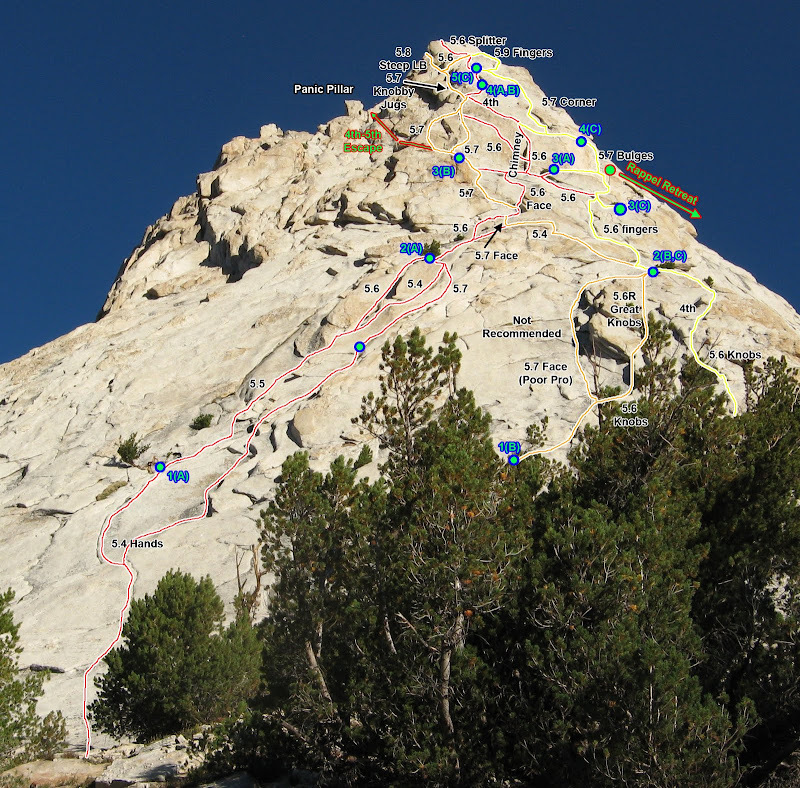 A note on our decision to solo most of Matthes Crest: Much of the crest is exposed 3rd and 4th, with a few 5th class moves. 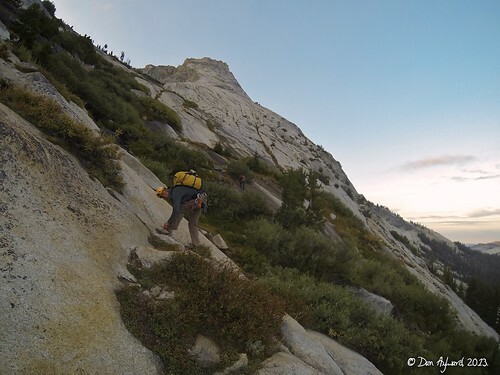 We felt comfortable soloing at this grade, and it also helped us to move much faster so we could include Tenaya and Cathedral in the adventure as well. We had our harnesses on and stayed together throughout the climb, just in case any one of us wanted to be belayed through a section. 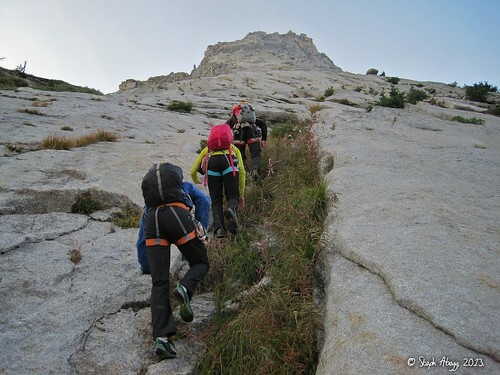 All of us opted for roping up on the final section between the South and North summits. Soloing Matthes Crest is a lot of fun, but it is not for everyone. I am neither a proponent nor a critic of soloing, I just simply am reporting on our chosen style for this climb, which worked out very well for us. Getting from Tenaya Peak to Matthes Crest involved a couple of hours of pleasant hiking along open Tuolumne terrain. 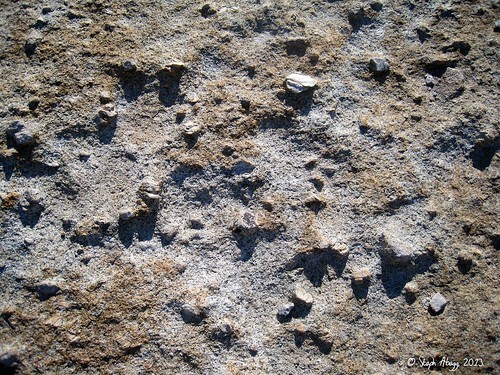 The rock in this area has large feldspar crystals ("phenocrysts"). 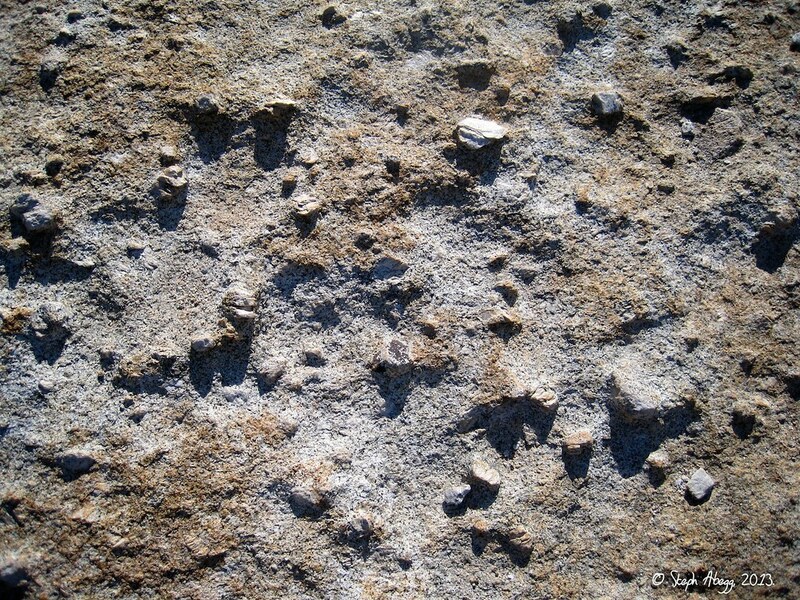 A phenocryst is a conspicuous, large crystal embedded in a finer-grained matrix of smaller crystals in a porphyritic igneous rock. Porphyrys are formed by a two-stage cooling of rising magma. First, deep crustal magma cools slowly, allowing formation of large phenocrysts (diameter 2 mm or more). Second, the magma cools rapidly at shallower depths having been injected upward or extruded by a volcano, allowing for formation of small crystals in the groundmass. Here we are in the meadowy area near Echo Lake, where we stopped to fill up our water bottles with somewhat marshy water. Earlier in the year or duing a less dry season there might be running water above the lake. This was the only water source on our route, since we did not find any water between Matthes Crest and Cathedral (but again, there might be water earlier in the year). Echo Peaks rise to the north. 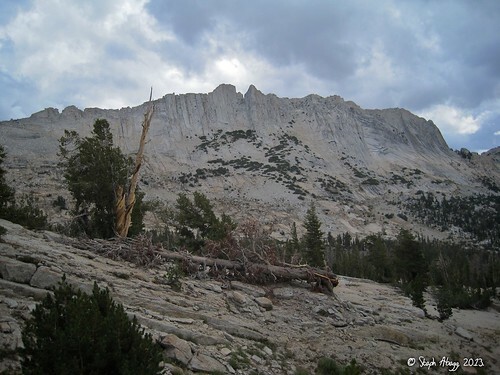 Looking up the south end of Matthes Crest. Note the climber near the top. 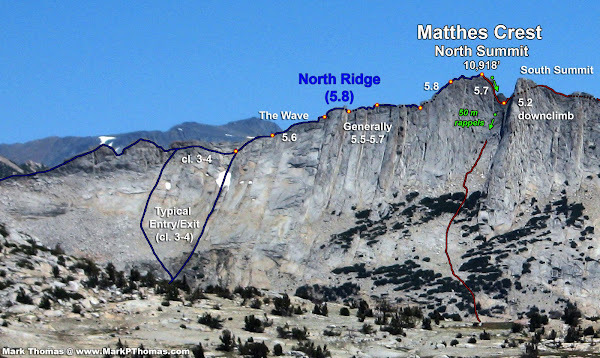 The climb up the south end of Matthes Crest is one of the steeper (5.5) and longer (3 pitches) sections of the climb. We put on rock shoes (or chalk for Chad) and our harnesses (just in case any of us suddenly felt the need of a belay) and soloed up to the crest. 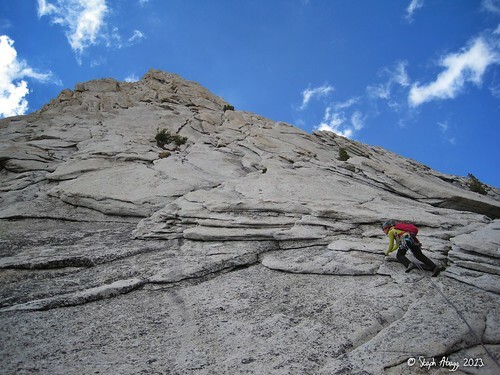 Chad carefully climbing up the steep south end of Matthes Crest. 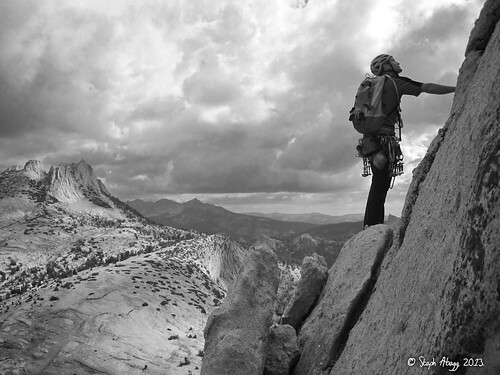 Steph climbing up the steep south end of Matthes Crest. 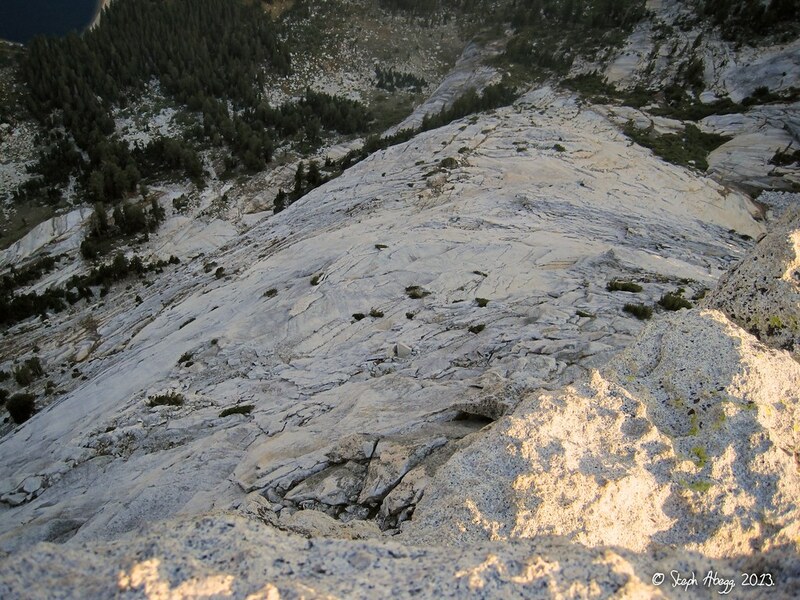 The Anduril (which has a 4-star 5.10b R route on its east side) is behind along ridge. 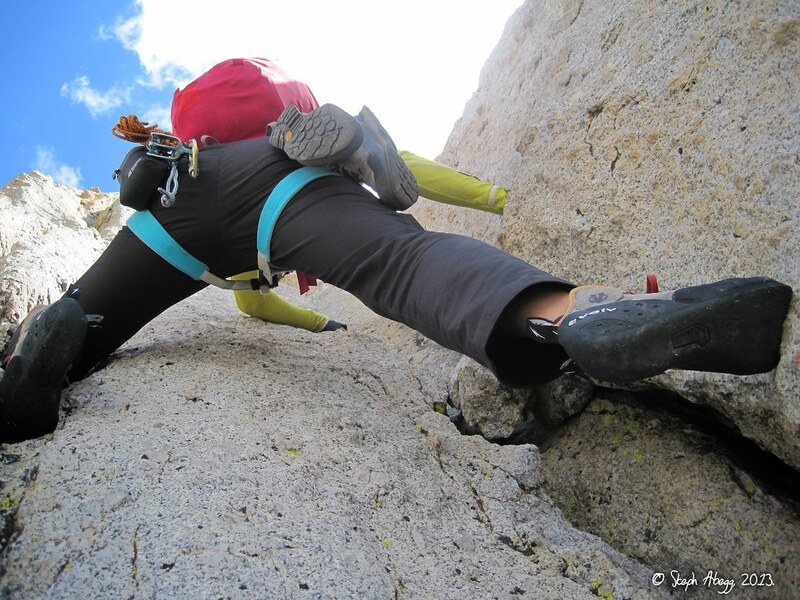 Steep for soloing! But super solid rock. 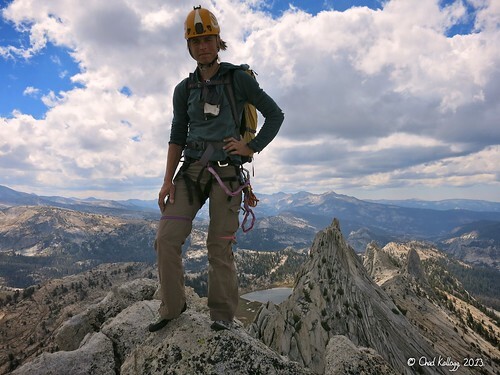 Sarah on the spectacular exposed ridge of Matthes Crest. The South (left) and North (right) summits beckon in the distance. Climbing along the spectacular Matthes Crest. Dan at the 5.4 undercling section (marked as topo #3 in the SuperTopo guide). The exposure of this section makes it a bit intimidating, but the holds are very good. The South summit (left) and the slightly higher North summit (right). The climbing gets a bit more challenging here so we roped up for the section between the South and North summits. Chad climbing up to the South summit. The North summit is on the right. Steph on the South summit. It took 1:16 to get from the base at the south end to the top of the South summit. Looking up the final pitch to the North summit from the notch between the summits. Dan is belaying at the top. We belayed this section since the lower section of the pitch is 5.7 (or there's also a 5.8 offwidth option, which Dan chose to climb). Sarah topping out on the North summit, with the South summit behind. It took us 2:15 to get from the base at the south end to the top of the North summit (1 hour between South and North summits). Looking back at climbers along the knife-edge crest. Looking north towards the continuation of Matthes Crest from the North summit. Few people continue past the North summit. 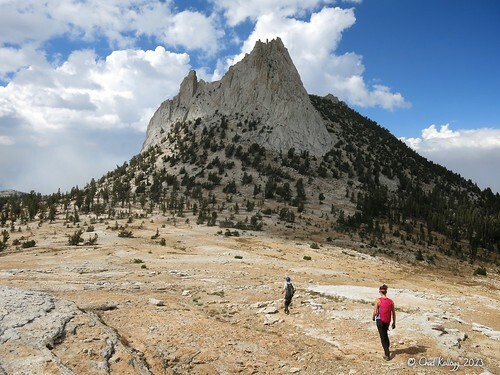 We had planned to, but the threat of thundershowers along with worrysome smoke buildup near where Sarah's car was parked at the Cathedral trailhead encouraged us to descend from the North summit. SuperTopo: "Rappelling from the south summit is the most common mistake—it's unusual for ropes not to get snagged. 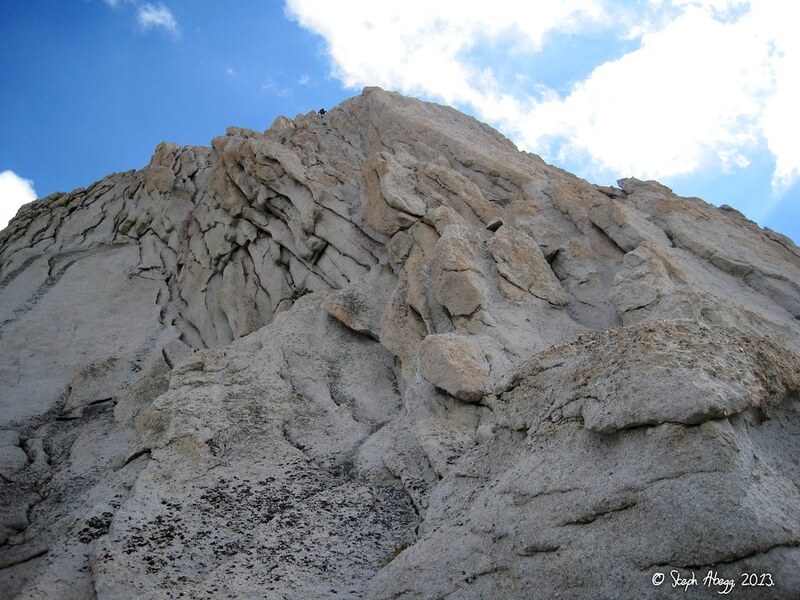 Instead, climb back down the ridgetop for 100 feet then traverse easy ledges on the east side of the ridge. Place pro to protect followers. 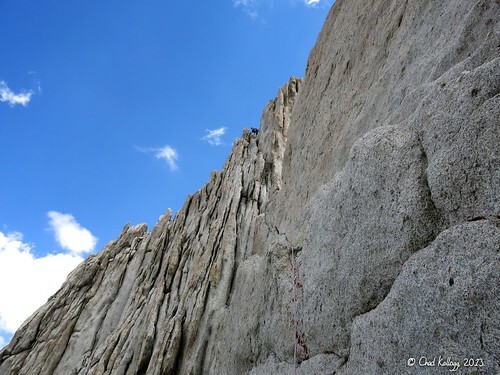 Most parties rappel from the north summit (two double-length rappels to the west); continuing north presents increasing difficulties and great climbing but poor protection, especially for the follower." The first of two double rope rappels from the North summit. Looking up the second of two double rope rappels from the North summit. Sarah on the second of two double rope rappels from the North summit. 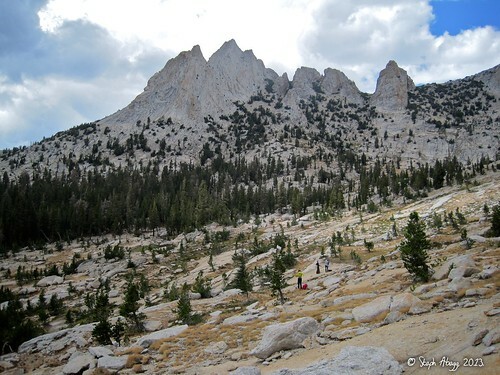 We traversed to the left of Echo Peaks on the way from Matthes Crest to Cathedral Peak. Looking back at Matthes Crest. The North and South summits are the two highpoints on the ridge. Another great route overlay by Mark Thomas showing the main route variations of the SE Buttress of Cathedral Peak. I had climbed Cathedral Peak with Mark at the beginning of the summer. 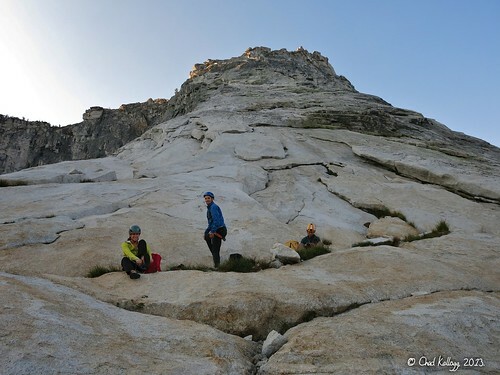 The Southeast Buttress of Cathedral Peak is one of the most popular climbs in Tuolumne, consisting of five pitches of easy and moderate crack and face climbing in a perfect setting. I had climbed Cathedral while on the Cathedral Traverse a couple of months previous and Chad had climbed it years ago; but Dan and Sarah had not ever climbed Cathedral, plus it made for a cooler linkup to include Cathedral rather than walk right past such a compelling spire of granite. 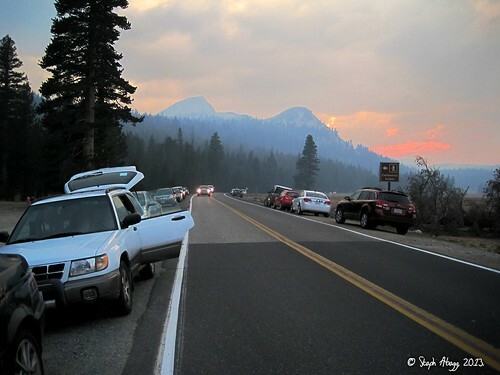 Despite our worry over the smoke settling into Tuolume Meadows below, we figured we could simulclimb Cathedral quickly and retrieve the car before the smoke got too bad. It took Dan and Chad 1:23 to get from the base to the summit. It took Sarah and me a bit longer (but still under 2 hours) because on my simulclimbed pitch I was suckered into a variation off to the left and we ended up wrapping around Panic Pillar and corkscrewing around to the summit block. Cathedral Peak, the final summit destination of our TMC linkup. 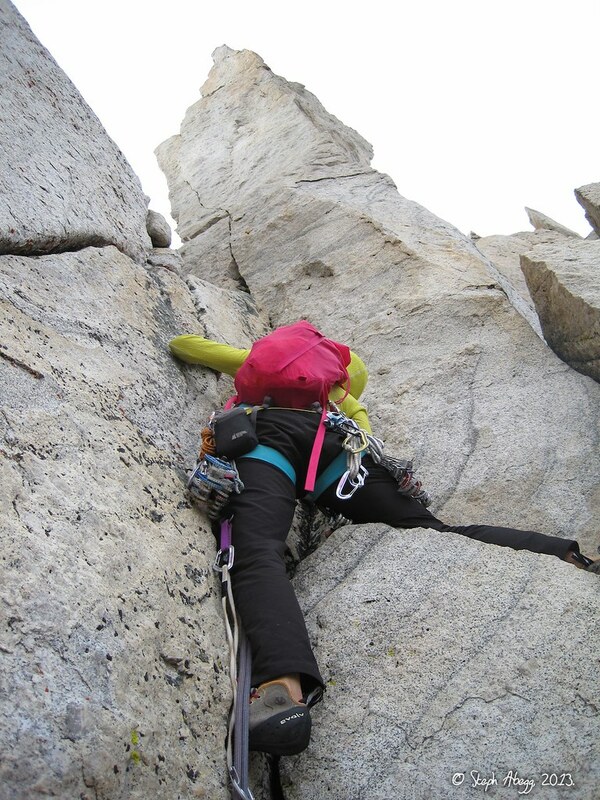 Sarah starting the Southeast Buttress. We simulclimbed to just below the summit area in two pitches. 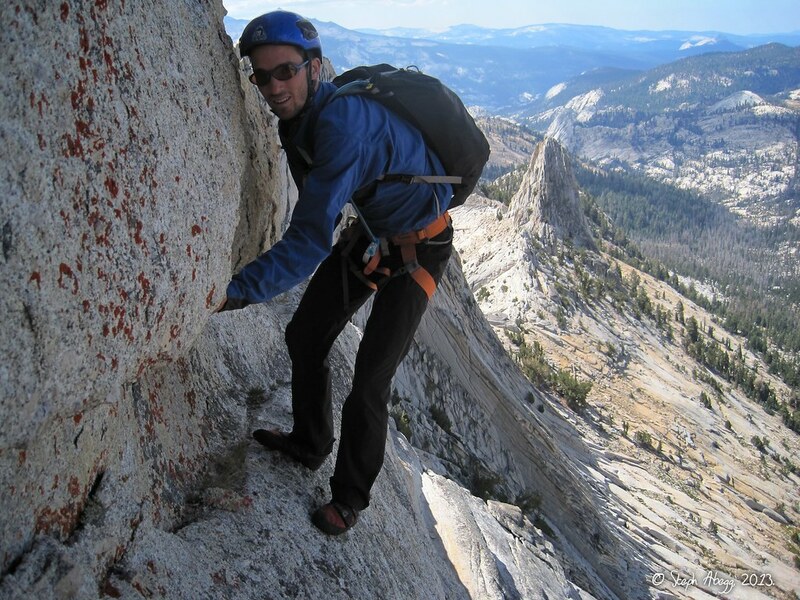 Chad midway up the Southeast Buttress. Echo Peaks are in the distance to the left. 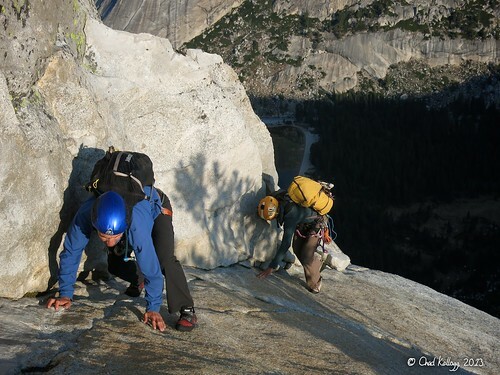 There are enough variations on the buttress that our two rope teams (Dan and Chad, Sarah and me) were able to climb at the same time. Sarah climbing a steeper (and fun!) 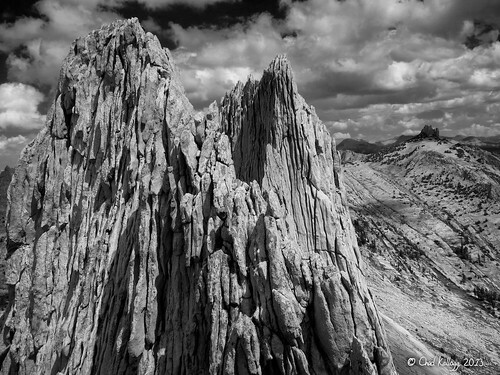 section just left of Panic Pillar near the summit of Cathedral Peak. 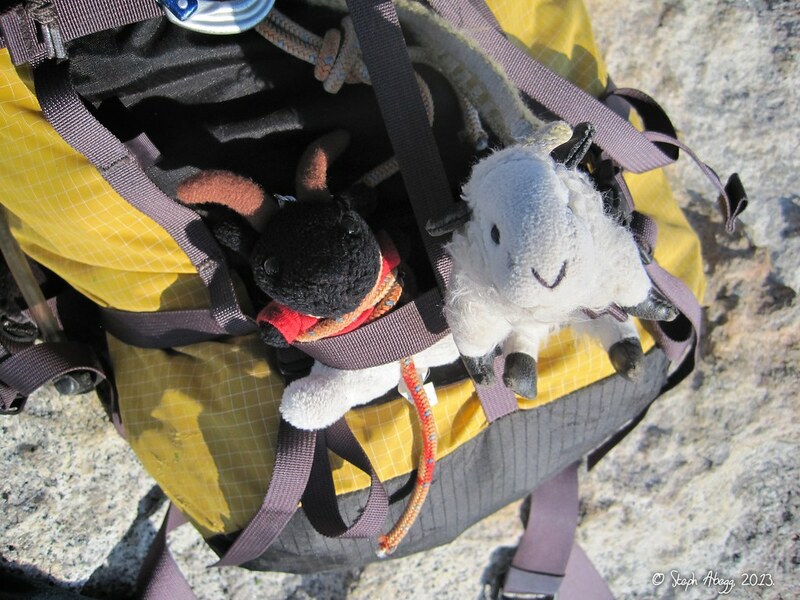 We did a corkscrew to the summit since I had led us a bit left of the standard route. 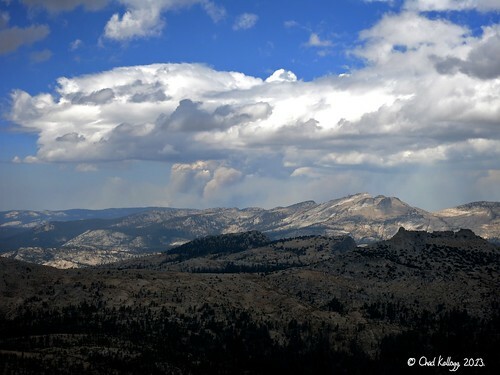 On the summit of Cathedral Peak, smoke from the fires below. This fire—called the Rim Fire—ended up being one of California's largest wildfires in recorded history. More photos and info about the fire are at the bottom of this trip report. Echo Peaks to the south. 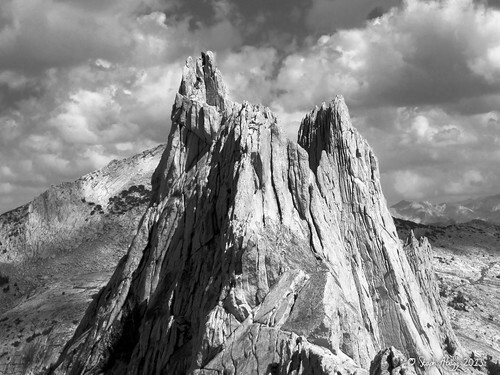 I climbed all 10.5 of these while doing the Cathedral Traverse a couple of months previous. 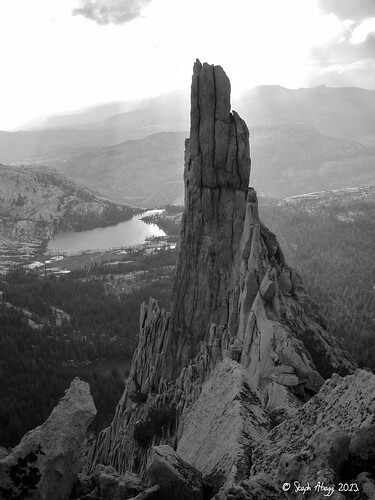 Eichorn's Pinnacle. There is a fun and exposed 5.4 route up to the top of this pinnacle. We decided not to climb it on this day, but I had climbed it during the Cathedral Traverse a couple of months previous. 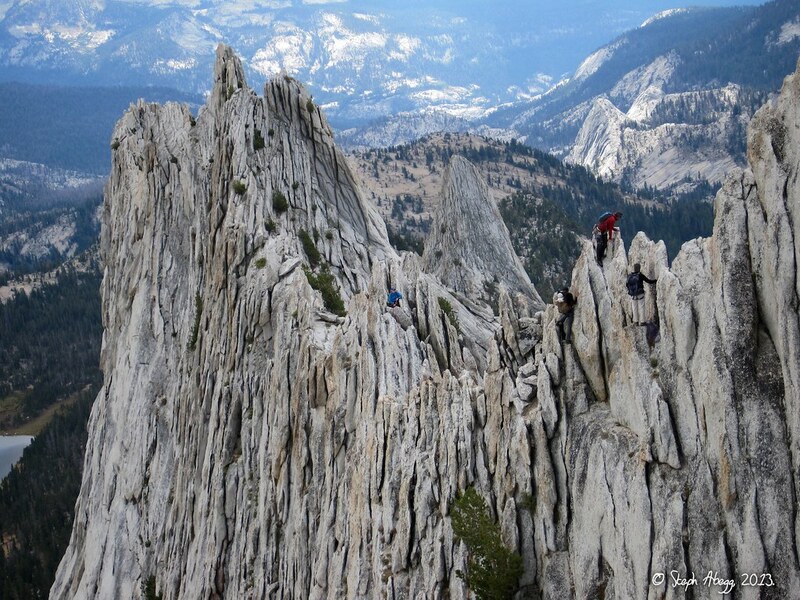 This pinnacle makes for a great summit photo. Some nice stone steps on the trail to/from Cathedral Peak. 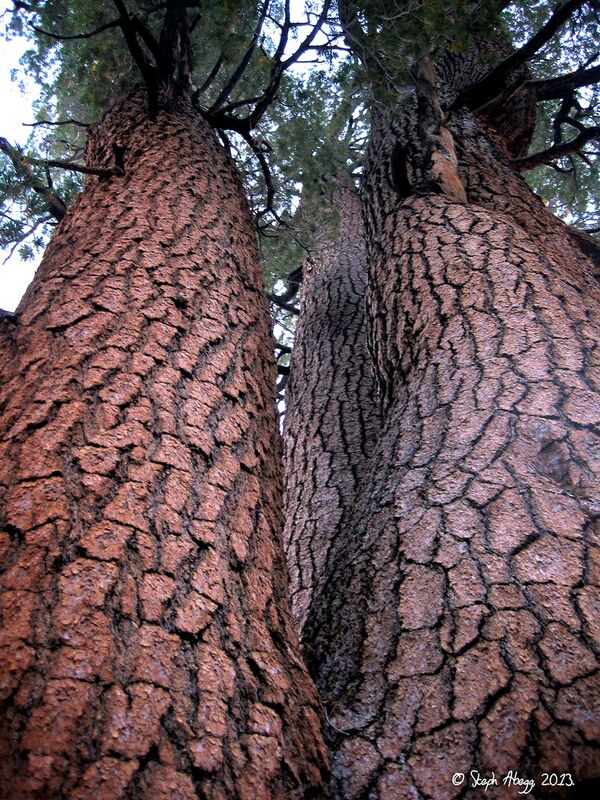 Some big trees on the hike out to Cathedral Lakes trailhead where Sarah's car was parked. 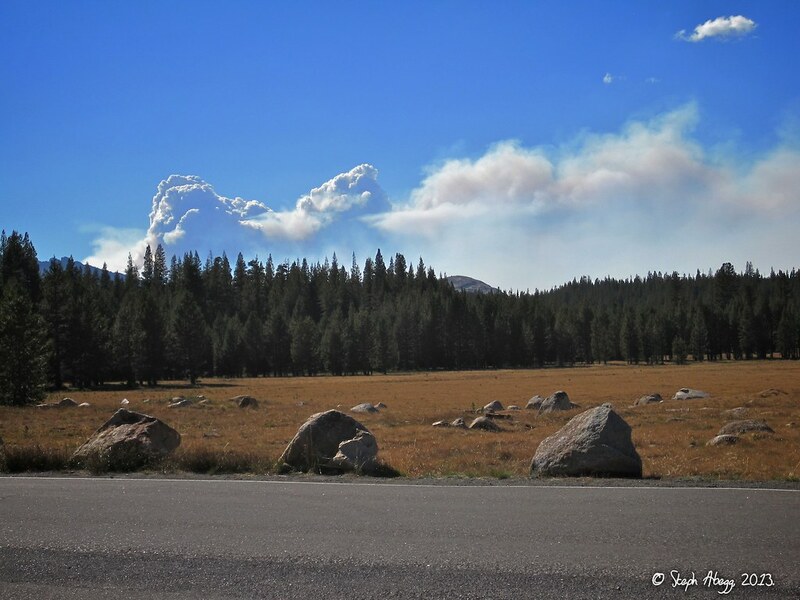 Over the course of our California climbing roadtrip, a major wildfire (the so-called "Rim Fire") developed just west of Yosemite National Park in Tuolumne County. The fire had begun on August 17, and by the time we did the Tenaya-Matthes-Cathedral linkup on August 27, the Rim Fire had charred nearly 200,000 acres and was already the 6th largest wildfire in state history (by the time the fire burned out over a month later, it had moved up in the ranks to the 3rd largest wildfire in state history). 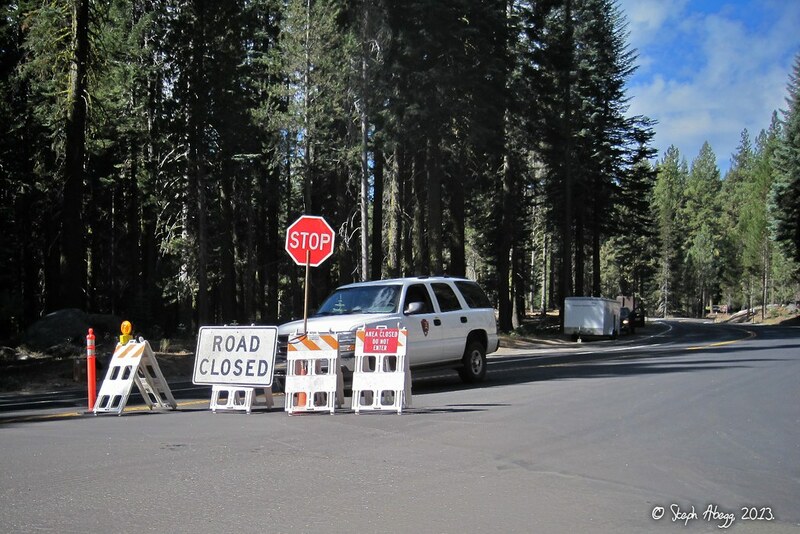 The following day HWY 120 was barricaded at the west side of Yosemite National Park, a mandatory evacuation of residences north of Old Yosemite Road was ordered, and some campgrounds and lodges were closed. 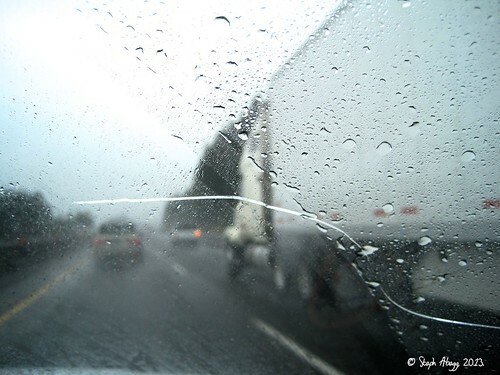 When we left to drive back home to Washington, the fire was still less than 30% contained; with the forecast calling for strong winds and hot weather, the raging blaze was expected to move farther into the park and threaten wildlife, giant sequoias, and the Hetch Hetchy Reservoir that provides most of San Francisco's water. 4:29pm, Aug 26. Wildfire smoke in the distance, as seen from Tuolumne Meadows the afternoon before we did the TMC linkup. 1:02pm, Aug 27. Wildfires in the distance, as seen from the North summit of Matthes Crest. 3:04pm, Aug 27. 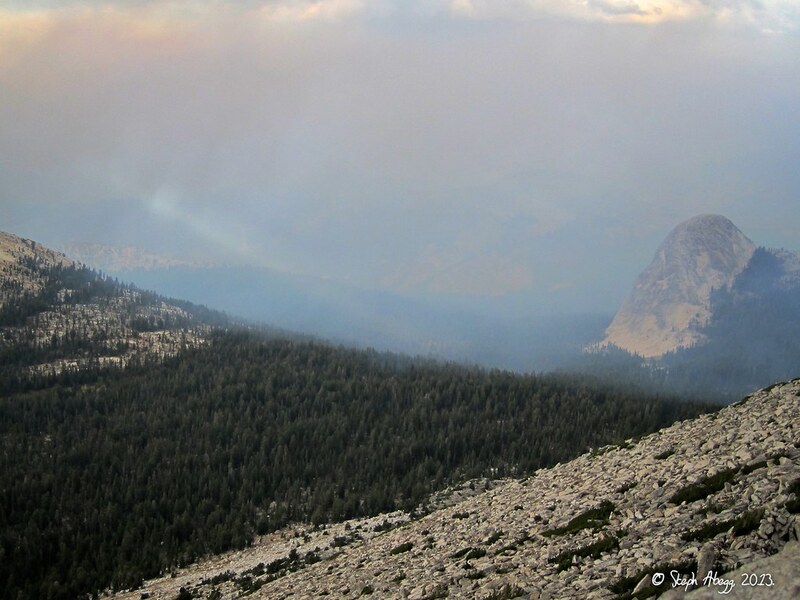 Smoke had entered Tuolumne Meadows by the time we arrived at Cathedral Peak. 5:20pm, Aug 27. The smoke had become thicker by the time we arrived at the summit of Cathedral Peak. 7:01pm, Aug 27. 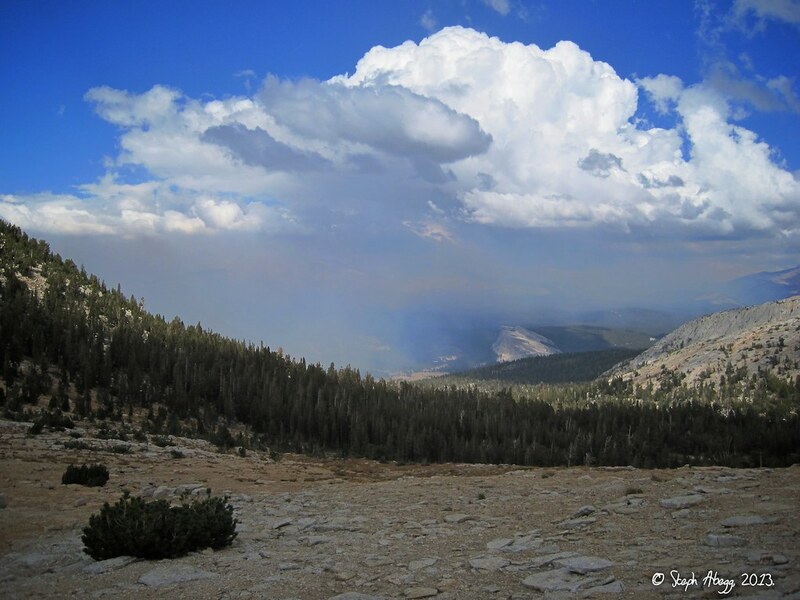 We could definitely smell the smoke in the air at the Cathedral Lakes trailhead. 9:59am, Aug 28. Fires just north of Highway 120 as we drove between Tuolumne and the Valley. 10:10am, Aug 28. Highway 120 had just been closed on the west end of Yosemite National Park.